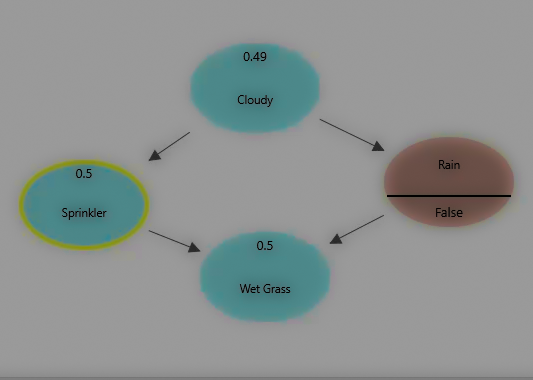 Bayesian Network software with the simplest, easiest and modern Graphical Interface. By using a directed graphical model, Bayesian Network describes random variables and conditional dependencies. Create a Bayesian network in a very intuitive way, and find the Root cause hypotheses. When you observe a state of a variable, instantiate the state of the Variable. For example, we observed that Grass is Wet, so we instantiated the Grass Variable = True. Based on the Observation, the Probability of Rain = True is updated. Not only just Yes/No or True/False type boolean states, rather a variable can have more than 2 states. The Conditional Probability tables are easy to use and scaling of probabilities are easily done. Apply Bayesian Inference to update beliefs upon observations from experiments. When you have many random variables to work with, a Bayesian Network Conditional Probability Table can be very complicated and becomes fairly impractical in real life diagnostics. Therefore, you need to incorporate one observation at a time and update the beliefs accordingly. Here, the diachronic interpretation comes into play. “Diachronic” means that something is happening over time; When we receive new data (new observation), the probability of our hypotheses changes. Diachronic Interpretation is a systematic way to update our beliefs as we get new data. In a lab-like setting, you can add as many mutually exclusive and non-exclusive hypotheses, add as many experiments and observation you want, and run a causal discovery session to find out the probability of your hypotheses. Diachronic interpretation tool can be used for various diagnostics from healthcare to daily problems. An example of understanding the cause of Nausea / Vomiting. Initial Hypotheses were Peptic Ulcer and Viral Gastroenteritis. The diachronic interpretation can be used to update the belief on Peptic Ulcer and Viral Gastroenteritis based on symptoms. An Intuitive Example of utilizing Artificial Neural Network (Perceptron) - Implementing 'Forward collision warning' with pedestrians detection.